Two days ago I practically chased this bike down the sidewalk (here's the link to that awful picture). Tonight the Christmas caroling pedicab was parked outside the Lincoln Park Zoo, waiting to transport people to and from Zoo Lights. It was worth returning to Zoo Lights (I fled the crowds Friday night) just to see this bike again. Its driver didn't want to be photographed but he was more than happy to point out all of his bike's bells and whistles. Literally. I think he counted 11 different bells--and one very loud blow horn--that he and his passengers could ring. 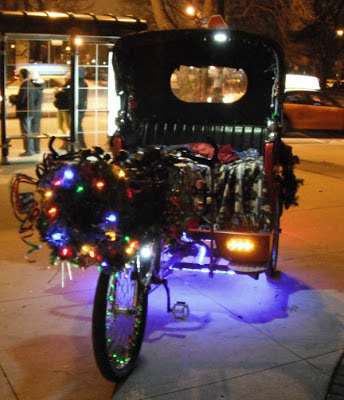 The Christmas tunes blasted from the stereo system in his wreath-adorned bike basket, and his outfit could have easily walked off the stage production of A Christmas Carol--top hat, sprig of holly and all). And he told me I'd have to take a ride. Next time...though I'd beg to pedal it before sitting as a passenger. Have you seen this pedi-cab pedaling around town?